Phylogenetic trees are branching diagrams that depict hypotheses of evolutionary relationships between extant and/or extinct organisms. In particular, they depict degrees of relationship among organisms, indicating that certain groups of organisms are more closely related to one another than they are to other groups. In 1837, Charles Darwin sketched one of the earliest known phylogenetic trees in a notebook, which was followed by another such tree in On the Origin of Species in 1859 (it was the book’s lone figure). 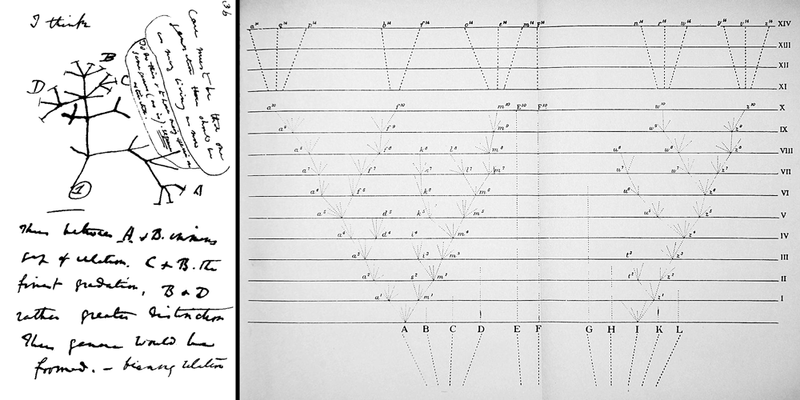 Left: a 1837 sketch of a phylogenetic trees in one of Darwin’s notebooks. Right: a phylogenetic tree in Darwin’s On the Origin of Species, the only figure in the book. To the extent possible under law, Digital Encyclopedia of Ancient Life has waived all copyright and related or neighboring rights to Darwin’s trees. This work is published from: United States. Section 4.2.1 of this chapter describes how to read and interpret phylogenetic tree diagrams. Until the 1970’s, most published phylogenetic trees were based on rather subjective data, generally consisting of the “gut feelings” of experts based on their knowledge of the morphologies of particular groups of organisms. This changed during the “cladistic revolution,” which was initiated by German entomologist Willi Hennig (1913-1976). A brief biography of Hennig may be accessed on the webpage of the Willi Hennig Society. Willi Hennig. Photograph by his son Gerd Hennig. (Creative Commons Attribution-Share Alike 3.0 Unported; publication under GFDL allowed). 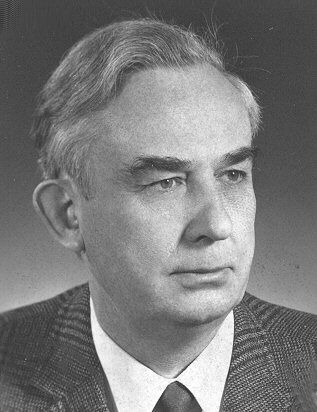 Hennig developed an evidence-based methodology (termed cladistics) for developing phylogenetic hypotheses. One of his most important insights was that only certain types of characteristics are useful for determining relationships. This approach is outlined in Section 4.2.1. Biologists and paleontologists do not construct phylogenetic trees simply for the sake of doing so. Instead, trees, or diagram depicting hypotheses of evolutionary relationships among taxa, are constructed in order to help researchers understand evolutionary processes and the histories of particular groups. For example, phylogenetic trees can be used to understand how particular structures evolved and the order in which they appeared (this is described more in Section 4.2.3). Phylogenetic trees can also be used to investigate the biogeographic histories of groups of plants and animals, or the history of the development of their geographic ranges (for example, see the recent study about spider biogeography by Harrison et al., 2017 in PLoS ONE). Phylogenetic trees are also very useful for developing classifications of organisms that reflect their evolutionary histories and relationships. This topic is further explored in Section 4.2.4 of this chapter. Harrison, S. E., M. S. Harvey, S. J. B. Cooper, A. D. Austin, and M. G. Rix. 2017. Across the Indian Ocean: a remarkable example of trans-oceanic dispersal in an austral mygalomorph spider. PLoS ONE 12(8): e0180139. https://doi.org/10.1371/journal.pone.0180139.